A Powerful Connection Gerry Barousse '80 helped found the Bayou District Foundation, which is developing a community that replaced a flooded housing development in New Orleans. 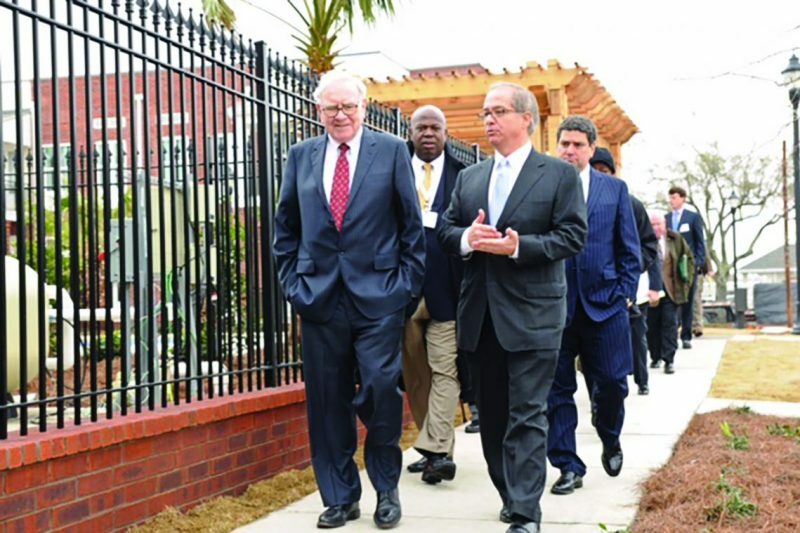 Barousse (front, right) shows off the project to Warren Buffett. Courtesy photo. A phone call from a fellow W&L alum launched Gerry Barousse ’80 into a venture that has transformed a once-blighted area of New Orleans into a model purpose-built community. After Hurricane Katrina ravaged his home city in 2005, Barousse received a call from Charles Yates ’70, who had coached and taught him in middle school, and with whom he had stayed in touch through his real estate development business. Yates had since moved back to Atlanta, where he invited Barousse to tour East Lake, a mixed-income community that replaced a crime-ridden housing development bordering the East Lake golf course. Inspired, Barousse returned home and helped found the Bayou District Foundation (BDF), which he serves as chairman. Since its inception in 2006, the foundation has been developing Columbia Parc, a community that replaced the flooded St. Bernard Housing Project in the Gentilly neighborhood. The scope of the 18-block project is enormous. The foundation’s philosophy is to build luxury apartments for citizens of all incomes. The first residents arrived in March 2010. Of the 685 households in Columbia Parc, 493 receive public housing or reduced rent. The positive impact is already evident, with crime reduced by nearly 100 percent from the pre-Katrina years. BDF has also initiated what it calls a cradle-to-college-education pipeline, with an early-childhood education center already open and a K-8 charter school scheduled to open next year. A permanent on-site health clinic opened in September 2017, and a grocery store and a pharmacy will begin this year. BDF and City Park New Orleans have partnered to build a world-class, Rees Jones-designed, 18-hole golf course that replaces two damaged former golf courses. Through this partnership with the park, BDF will share net income from golf operations (approximating $500,000 annually for BDF), which will support BDF’s community programs. For Barousse, the golf component is a natural fit; he was an All-American golfer at W&L. He also coached little league football and basketball during his time in Lexington and enjoyed his interactions with the kids. He coached blind golfer Pat Browne for 21 years, with the pair winning the U.S. Blind Golf Association Championship 20 years in a row. He says his sense of civic responsibility was instilled by his family and reinforced at W&L. He admitted he was not a fan when his alma mater went co-ed. Fate, however, presented him with three daughters, two of whom have already graduated from W&L — Lauren ’10 and Jeanne Rene ’12. He enjoyed coming back to Lexington for Parents and Family Weekends and was pleased to find his daughters’ experience not that different from his own. He continues to serve the university as a class agent for the Annual Fund, a task he especially enjoys now that he can stay in touch with classmates through email. Barousse jokes that his wife, Jeanne, is ready for him to divert some of his formidable energy back into non-volunteer activities. Don’t count on it. 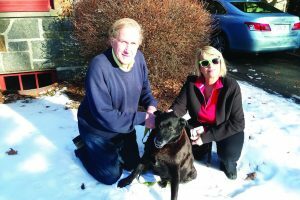 He is eager to share the success of Columbia Park with other communities, just as Charlie Yates shared East Lake with him in that fateful call.